The Bible speaks of the conditions during the millennium as a perfect environment physically and spiritually. It will be a time of peace (Micah 4:2–4; Isaiah 32:17–18), joy (Isaiah 61:7, 10), and comfort (Isaiah 40:1–2). 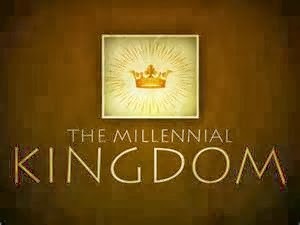 The Bible also tells us that only believers will enter the millennial kingdom. Because of this, it will be a time of obedience (Jeremiah 31:33), holiness (Isaiah 35:8), truth (Isaiah 65:16), and the knowledge of God (Isaiah 11:9, Habakkuk 2:14). Christ will rule as king (Isaiah 9:3–7; 11:1–10). Nobles and governors will also rule (Isaiah 32:1; Matthew 19:28), and Jerusalem will be the political center of the world (Zechariah 8:3). The coming Millennial Kingdom wherein Jesus rules physically over the entire earth, is made very clear to us in Daniel 2 as well as many other places (like those noted above). Daniel 2 informs us that the Stone made without human hands crashes into the Gentile kingdoms of this earth, destroying everything about them so that nothing of them remains. Moreover, that coming future Kingdom will fill the entire earth (Daniel 2:31-45). Because the Gentile kingdoms listed in the text were actual, physical kingdoms, we can conclude that the final Kingdom of Daniel 2:44 will also be physical in nature. If Jesus came to earth the first time physically, He will come to earth a second time, also physically. This is promised throughout Scripture (Zechariah 10:9-10, etc.). Regarding A Renewed Heavens and Earth, the coming Millennial Kingdom will be very much like what Adam and Eve experienced in the Garden of Eden prior to their failure to keep God’s single command and resultant fall because of it. However, there is some disagreement among Bible scholars regarding the nature of the new heavens and earth during the Millennial Kingdom. This is due to the similar – but not exact – descriptions found in Isaiah versus Revelation. In the Revelation version (Revelation 21), there is no more death, yet in the Isaiah passages, death appears to be a possibility. There are other differences as well. It is reasonable to conclude that if the Lord Jesus does not actually completely recreate a new earth and heavens for the Millennium, He will certainly renovate or renew what remains upon His return. Following His return, He will judge the nations (Sheep and the Goats; Matthew 25:31-46), and will then set up His Millennial Kingdom. Clearly, from the numerous passages in Scripture, the Millennium will be far better than anything the world has seen since the Garden of Eden. Jesus will need to do a good amount of “clean up” of the earth and the air immediately surrounding the earth. The best is still yet to come when eternity future begins following the Millennium and the Great White Throne Judgment. That is largely what Revelation 21 reveals. It is helpful to keep in mind that once the fall occurred in Genesis 3, things began to change on the earth drastically. God placed a curse upon Creation and He did this – believe it or not – for our benefit. Prior to the fall, it is implied that Adam did not work up a sweat when he toiled in the ground to keep God’s garden. After the fall, God said tilling the ground would become hard work, enough to make Adam sweat and would even be painful (cf. Genesis 3:17). That type of exertion would help keep Adam healthy as muscles were exercised to keep from atrophying. This curse also extended to other areas as well, like childbirth, which would cause considerable pain for women. God placed an enmity between the serpent and humanity as well. Living on planet earth changed and it will not be until the coming Millennial Kingdom that things will actually get better when these things will be reversed. During the coming 1,000-year reign of Jesus, the curse that God placed on the earth will be lifted. The original splendor and majesty of the earth and heavens will be miraculously renewed by God in Christ. Hear words from Isaiah 65:17-19 (KJV). Most scholars believe the above words apply to the Millennial Kingdom. However, it is also possible that like many portions of Scripture, Isaiah was speaking generally about eternity future. Nonetheless, we know that because of the terrible condition the earth will be in at the end of the Tribulation, Jesus will have to renovate things. But God seems to be just getting started here. Other portions of Scripture tell us more of the conditions during this time. In the above verses, there will be plenty of rain, which will give birth to plenty of crops that will feed all the people on the earth, including those born during the Millennium. Animals like the ox and donkey will eat clean food, food that has not been corrupted or tainted with GMO’s, pesticides, and all manner of chemicals. These substances have caused untold numbers of diseases leading to death, of which doctors usually wind up treating the symptoms for but not the actual source. Again, we see the very deserts bringing forth much abundance due to parched land turning into pools of water, all of this to God’s glory. God is going to renew what humanity destroyed through sin. In Isaiah 65:21 – 25 we learn that work will become the opposite of drudgery. People will find their work fulfilling. There will be a deep sense that people will gain the full benefit of their work directly. Verse 25 of that chapter also tells us about the difference that will exist in the animal kingdom then. Prior to the fall of mankind, there was no death, even within the animal kingdom. All creatures were herbivores, eating only vegetation, hence there was no need to kill anything for food. It was only after the fall that some animals became predators, attacking and killing other animals for food. Isaiah tells us in the above verse that the animal kingdom will revert to this situation that existed in the Garden of Eden. The wolf and the lamb will feed together (but the wolf will not feed on the lamb!). The lion will eat straw. The serpent will get its food from the dust. There will be no carnivores during the coming Millennial Kingdom. Beyond this, God will remove the pain of childbirth. Moreover, parents will raise children with no thought of sorrow as is often experienced in this life now because of the sin nature and all the evils throughout the world. Even though the sin nature will continue to exist in those who survive the Tribulation and enter the Millennial Kingdom, because Jesus will rule with a rod of iron, the sin nature will have no chance to gain the upper hand. Of course, as well, Satan will be imprisoned in the Pit during this time, unable to tempt people. Isaiah 65:20 announces a new phase in humanity occurring during the Millennium. This verse tells us that young or premature death will be a thing of the past. Anyone who does not live until at least 100 years old will be considered cursed. Today, it is normal for most to die well before they reach the century mark. In the future, it will be normal to live well beyond the century mark. People will experience the type of longevity of those who lived in the first few chapters of Genesis. Adam lived to be just under 1,000 as did others. Many lived to be multiple hundreds of years old. We can assume that the stages of youth, then teenage years, then young adult, and finally mature adult will be elongated so that being a teenager will last much longer than simply from ages 13 to 19. The coming Messianic Age will be a time of absolute rejoicing and praising God. The curse will be removed and people will, for the first time ever since the fall of humanity, live completely for God and enjoy all His benefits. Does this sound like fiction? Yes, absolutely only because we cannot adequately imagine it. Is God’s Word true? Yes, absolutely and proof of that is the fact that so much He has revealed to us has already come to pass. Know that what remains will also come to pass as well. We will be back next time with a brief understanding of the Abrahamic Covenant. It will be brief as it really needs its own series. We’ll also cover The Redeemed Israel next time as well. I hope you’ll join me then. Entry filed under: christianity, Cultural Marxism, Demonic, devil worship, dispensationalism, Emotional virtue, eternity, israel, Judaism, Political Correctness, Politically Correct, Politics, Religious - Christian - End Times, Religious - Christian - Prophecy, Religious - Christian - Theology, salvation, second coming, temple mount. Tags: king jesus, land of israel, millennial kingdom, millennial reign of jesus, millennial temple, new heavens and earth.